The City of Clarksville and Cumberland Bank & Trust have announced the winner of the 31st Annual Queen City Road Race Art Competition. The announcement and award presentations were made in an assembly at Kenwood Elementary School. This year’s Queen City Road Race posters and t-shirts will feature the artwork of Jade Curtiss, a 3rd grader at Kenwood. Miss Curtiss was presented a framed copy of this year’s poster featuring her art design by Cumberland Bank & Trust President Ron Sleigh during the assembly. Curtiss also received $100 in prize money, this year’s Queen City Road Race t-shirt and an entry form for the race. 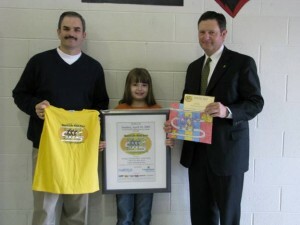 First runner up was Taylor Schmid, a 5th grader at Kenwood Elementary. Miss Schmid received a $25 Hobby Lobby gift certificate for the purchase of art supplies. 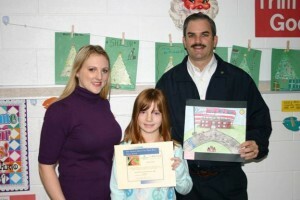 Second runner up Laura King, a 4th grade student at Barksdale Elementary, also received a $25 Hobby Lobby gift card. Congratulations to these young ladies for being selected out of 475 entries for the contest. The 31st Annual Queen City Road Race is set to take place Sunday, April 19, 2009. The race includes a 5K run, 1-mile walk, 1-mile wheelchair race, 5K Relay Run and a 1-mile Fun Run and begins at Austin Peay State University’s Governors’ Stadium. This year’s race is being sponsored by the City of Clarksville and Cumberland Bank & Trust. Other sponsors include Austin Peay State University, The Leaf Chronicle, WJZM, Q108 FM, The Beaver 100.3 FM, Eagle 94.3 FM, and Z97.5 FM. Entry forms are available at the Parks and Recreation Department, any Cumberland Bank & Trust branch, city community centers, or any physical education teacher. 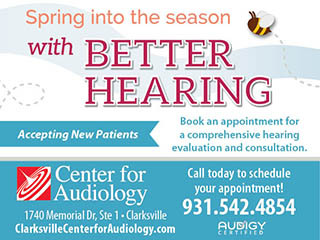 For more details, call 645-7476 or visit www.cityofclarksville.com/parksandrec. i am so happy for jade curtiss. 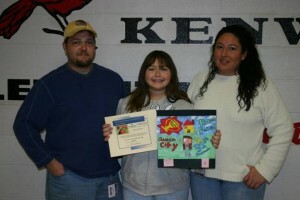 imagine a 3rd grader at kenwood having an imagination that is so wonderful that it wins art contests. jade is on the way to winning more contests and even awards in the education future. but not only during school years, but in her future after school is over. i am sure her family life inspires her to give her all. she is so beautiful too. i hope there are plenty of big autographed pictures available. i am hoping to get one, and i will be searching for one just for my scrapbook. my complements to jade curtiss and all the other contestants who participated in the contest.